With 5 Days until Arizona Gives Day Tuesday, April 2, 2019, meet Desi. Desi, a 7-year-old brood mom originally came to us in May 2017, and was relinquished in June 2018. Desi suffers from a condition known as intestinal lymphangiectasia, this means that Desi leaks lymphatic fluid into her GI Tract instead of recirculating it. Desi’s body cannot retain protein. Desi is on permanent medical hold, and her medication bill alone is over $500 per month. 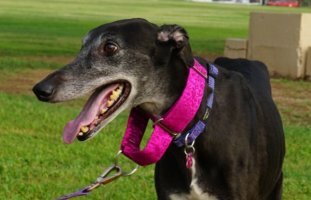 Please consider donating on Arizona Gives Day Tuesday, April 2, 2019, so that we may continue to help any other hounds like Desi who come our way.